Remove eye and lip makeup gently while soothing and hydrating your skin. 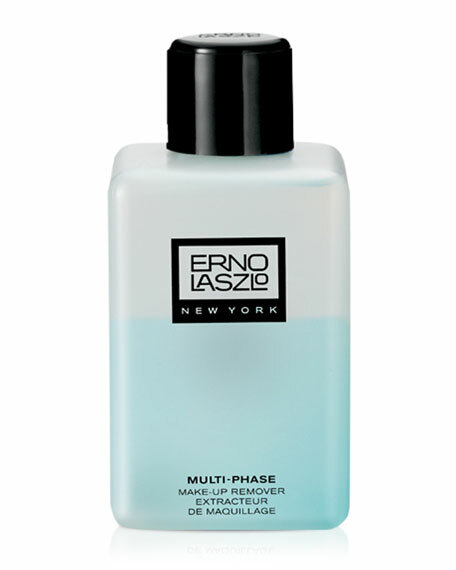 Duo-phase preparation: Oil loosens makeup and water cleanses to dissolve cosmetics completely. Cucumber Extract, Aloe Vera, and Witch Hazel Extract condition and calm under-eye puffiness. Shake to mix, then saturate a cotton ball with remover. Sweep over the face and then across eyelids, moving from inner corners outward. Remove mascara, gently sweep along lashes, moving from base to tip until clean. Follow with the Erno Laszlo Timeless Skin System rituals.